Polish people the world over love their sweet endings, and desserts are a significant part of traditional Polish cuisine. As simple and inviting as a warm chestnut cookie or as elegant and regal as a tall mocha torte, classic Polish dishes are rich in heritage and flavor. 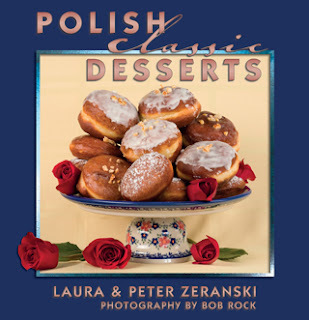 This collection is dedicated to the legacy of desserts that those of Polish descent may remember from childhood and to preserving the heritage of classic recipes. Close your eyes and let your mind explore the aromas of decadent chocolate, rich vanilla, bright lemon zest, the fresh yeast of a dough rising in the oven, or the blend of ginger, honey and raspberry in one delectable bite. Let your taste buds imagine the comfort of a warm donut filled with sweet jam, or the fluffy, light sweetness of a crème cake favored by Pope John Paul II, or the delicacy of a sweet cheese-filled crepe topped with fresh berries. Those are the flavors that millions of Poles around the globe grew up with. Those are the flavors that this book preserves for our sensory pleasure, for the delight of our young, and for the amazement of their children to follow.